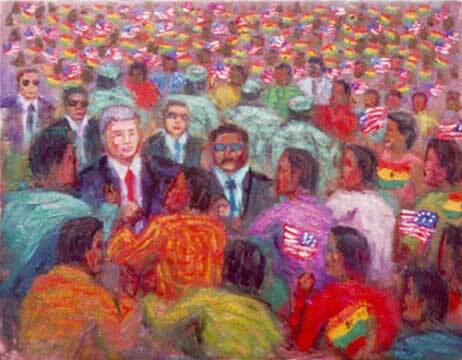 In the spring of 1998 the President toured sub-Saharan Africa to promote peace and offer American economic aid. In this picture from Ghana, almost 500,000 people turned out to cheer Clinton. The crowd was so enthusiastic that they almost crushed the President as they surged forward to greet him. He was able to take control and calm the people, and there were no casualties.